Most people do not know that you can dye your hair effectively at home without any chemicals. Just a couple of tea bags and some herbs will dye your hair naturally. This method is cheap and effective. Boil one cup of water in a large pan. Adding three tea bags to the water allow the tea to steep. Add one teaspoon each of rosemary and sage (either fresh or dried) to the tea. Allow the tea to sit for 24 hours. tea into a large enough bowl to place the majority of your head into. (If you prefer you can pour the tea into a spray bottle, these can be bought at almost any department store and are relatively cheap in price). Shampoo your hair as you normally do. 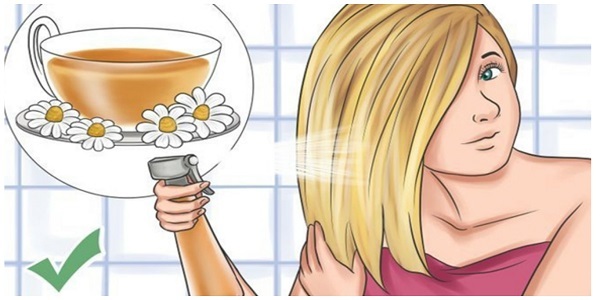 Pour the tea onto your hair making sure you cover your whole head with the tea. (You can use the spray bottle to spray the mixture onto your head instead if this method is easier for you). Slightly dry your hair with a towel but do not rinse. Your hair should be darker in color almost immediately but you may need to continue the process until you reach the color you want.